This original article is written by Shazly Makeen from WoM Lanka and cross-posted here by permission. Share Online makes it easy to post photos from your Nokia device straight to your photo sharing site. But what’s the use if it doesn’t support a photo sharing site of your choice? I use Share Online to upload pictures taken from my device to my Flickr account via MobyPicture. But two days back I found that I can directly post it to Flickr through Share Online. So I quickly opened Share Online went to OPTION > ADD NEW ACCOUNT > UPDATE SERVICES. Nothing new appeared and utterly disappointed to learn that this particular service is only available to a handful of countries. So what can we do if we are in a country like Sri Lanka, India or Saudi, which is not in the list? Fairly simple, just follow the following steps and you will be happy as I am. 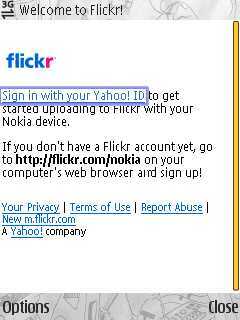 Configuring Flickr on Share Online 3: From your Share Online enabled Nokia device point your browser to http://m.flickr.com/nokia/signin/ then you will be prompted to login to your flickr account and then to download the .cfg configuration file. 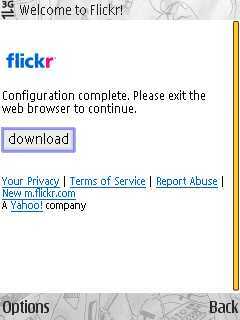 Configuring Flickr on Share Online 4: The above mentioned method will not work. You will have to download the flickr_configuration_file.cfg file (95.5 KB) from here to your Nokia device and unzip it, then activate.